If you’ve ever bought a box of Mini Milk Ice Lollies, you’re probably aware each box has three flavours – chocolate, strawberry and vanilla. In our household, it’s the vanilla flavour that always disappears the fastest. 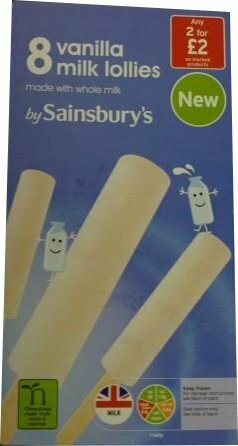 So I was delighted to find these yummy vanillia milk ice lollies new in the freezer section of Sainsbury’s. They’re delicious and taste just like a frozen vanilla milkshake on a stick. Each ice lolly has just 48 calories and is suitable for vegetarians. Although they’re low in fat and calories, has lolly has nearly two teaspoons of sugar. This means they’re a high sugar product for their size. Each box of vanilla flavour milk lollies comes in a box of 8 and they’re available in branches of Sainsbury’s.